Does the Pentax Q compact camera finally deliver palm-sized power? The Pentax Q is being billed as the world's smallest and lightest compact system camera - but does it live up to its rep or is it all just PR-speak? When we were asked to review the Pentax Q camera, which we were told takes quality pictures and videos, despite being the smallest compact camera on the market, we were so excited, a little bit of wee came out. Since the Olympus E-P1 and Panasonic GH1 - which, at the time, were among the world's best digital compact cameras - were first launched in late 2009, mirrorless compacts that offered the ability to change lenses like their bigger DSLR brothers have been promising much. But with standard prime (and bright) f/1.9 lens attached, the 12.4 megapixel 1/2.3-inch CMOS sensor sporting Pentax Q is, for us, the first Compact System Camera to actually live up to all of the system's claims and provide near DSLR quality in a portable form. It's basically what we've been hoping for since day one: the 'Q' fits in the palm and is only marginally broader than a bog standard fixed lens point and shoot. Indeed you really have to see it in real life to appreciate how small it is compared to the competition, also including the Sony NEX, Samsung NX and new Nikon '1' systems. If there's a negative, the claimed 'world's smallest and lightest' system camera proportions at first glance lend the enigmatic 'Q' the look and feel of a spy camera. Or worse still a toy camera. However, switch it on, start using it and you'll discover this is a grown up proposition, with a menu system, function options and handling that have trickled down from Pentax's K series DSLRs. Retail price for the 'Q' is a suggested £599.99 for the single lens kit or £729.99 for a twin kit. So you really would be buying this with the intention of finding a decent replacement for, or alternative to, your DSLR. 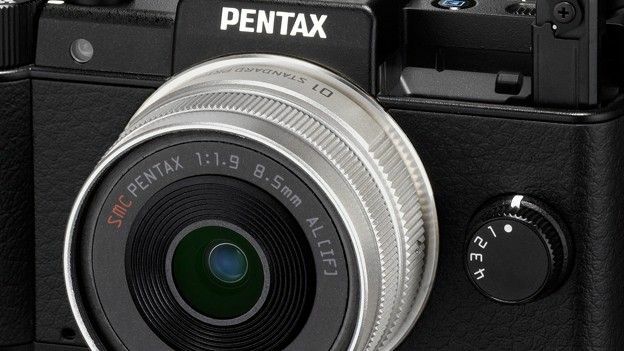 For a first attempt Pentax have delivered a small yet solid feel camera that packs in the controls we want, including a built-in flash that can additionally be raised if you're having problems with red eye due to its lens proximity. There's also a small mode dial to the right of the raised shutter release button, which is the most prominent control here, along with a DSLR-like back plate command dial and vacant hotshoe for supplementary flash. precision in order to make selections, it's a compromise we're OK to live with in return for the overall body proportions. There will inevitably be those who find the Q a bit too small, so it's worth a personal hands-on before purchase. The Pentax Q's 3-inch, 460k dot resolution fixed backscreen takes up three quarters of its body, with controls shunted over to the right hand edge where they fall under the thumb as the camera is gripped. The screen is surprisingly sharp and bright for one of point and shoot camera proportions, over-exposed portions of a shot indicated by flashing highlights upon playback. Fortunately this feature can be de-activated via the menus as soon as it gets irritating – which is fairly quickly. The Pentax Q powers up from cold in just over a second, the rear LCD gradually brightening. A half squeeze of the shutter release button and the first shot is focused and exposed near instantaneously, thanks partially to it deploying contrast detection auto focus. Squeeze the trigger fully and, without noticeable shutter lag a maximum resolution/best quality image is committed to memory in 1-2 seconds – all timings matching what you'd expect from an entry to mid level DSLR and bettering a point and shoot camera of roughly the same physical size. The Pentax Q comes with a wafer-sized rechargeable D-LI68 lithium battery that slots into one side of the camera, rather than the base as is traditional, whilst the standard SD card slots into the other side. The battery here is good for 230-250 shots from a full charge, which is no great shakes and indeed we found ourselves re-charging the battery sooner than expected. Our Q sample came supplied with the standard Q mount prime lens offering an equivalent 47mm in 35mm terms – so hardly one for wide angle shooting – and yet a usefully bright maximum aperture of f/1.9 to aid low light shooting. We found we got our best results when attempting still life shots and portraits, whereby the tighter angle of view could actually be used to our advantage, in blurring distracting background elements. With Raw and JPEG shooting plus Full HD movies, the spec is up to scratch, and video we shot using natural light looked great thanks to that brighter than average lens picking up plenty of detail. Mono sound might be the only disappointment but doubtless Pentax wanted to leave some room for possible improvement in subsequent models. If you were holding off buying a Compact System Camera until you could find one that could fit in a jacket (or at a squeeze trouser) pocket before taking the plunge, then that point has arrived with the Pentax Q. Though the styling may not be as luxurious as our personal favourites in the Olympus Pen or as practical as the Panasonic GF series, the 'Q' is smaller than both, and if less really is more as far as your opinion goes, there's currently only one choice.